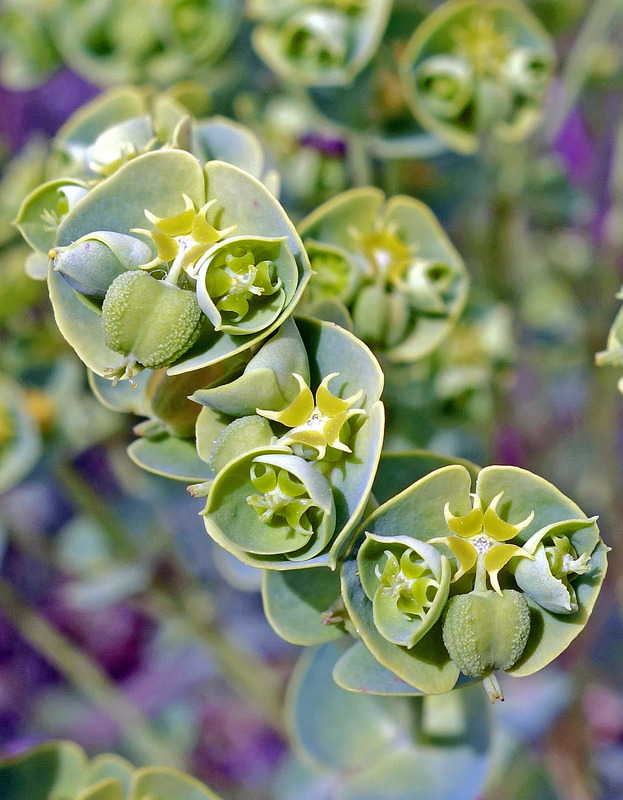 Sea spurge (Euphorbia paralias) is a common plant on dunes and sandy beaches, from the British Isles down to the Mediterranean. 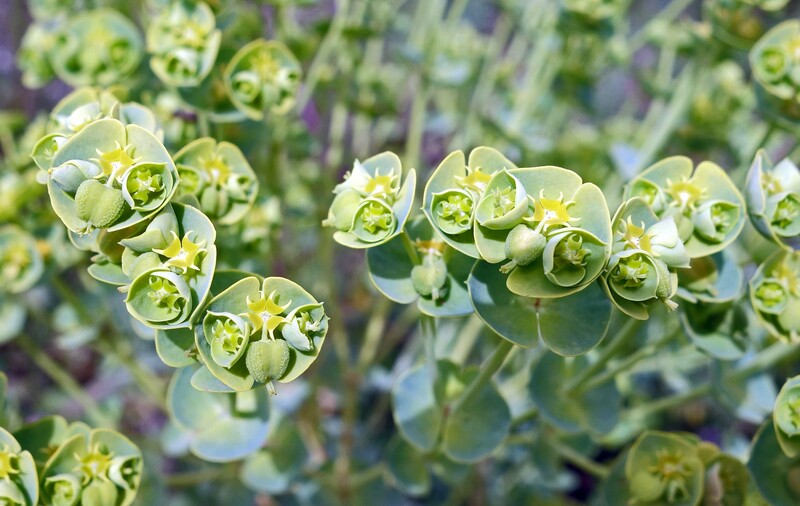 The stems are slightly fleshy and glaucous – nice word – meaning bluish-grey or green. 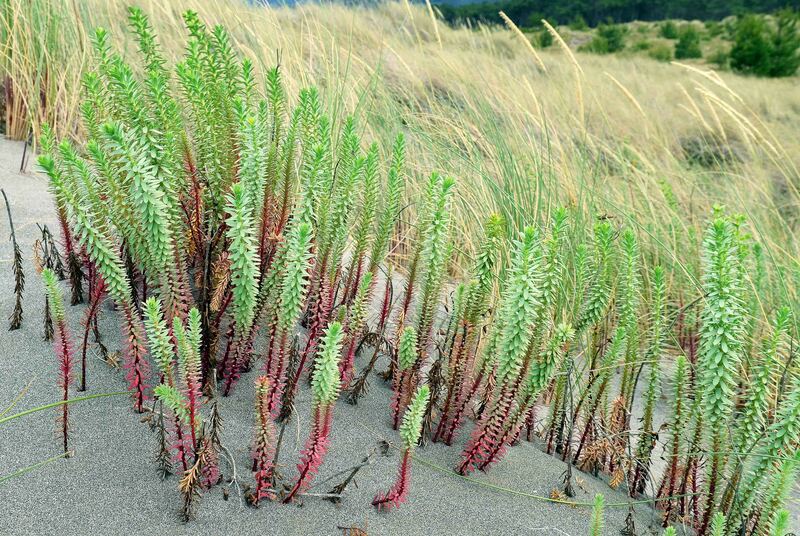 They do however, turn a reddish colour with age, giving a pleasing two-tone effect which contrasts attractively with the sand, through which they grow each year from a deep tap-root. In the Spring, they produce their remarkable receptacle-like flowers, which in close-up look to me like some sort of decoration for a miniature Christmas tree! The cup-shaped flower heads (see below) consist of a female flower – which is surrounded by male flowers (reduced to stamen) and four, crescent-shaped glands (known as involucre) which contain nectar, to attract pollinators. Ants are particularly attracted. A capsule-like fruit is produced, which contains just three large, resistant seeds, which reportedly can float in sea water and remain viable for several years (1). The plant can grow to about 70 cm, consisting of multiple stems, which each divide into about 3-5 flowering branches near their tips. See if you can spot the ant on this plant (below)! 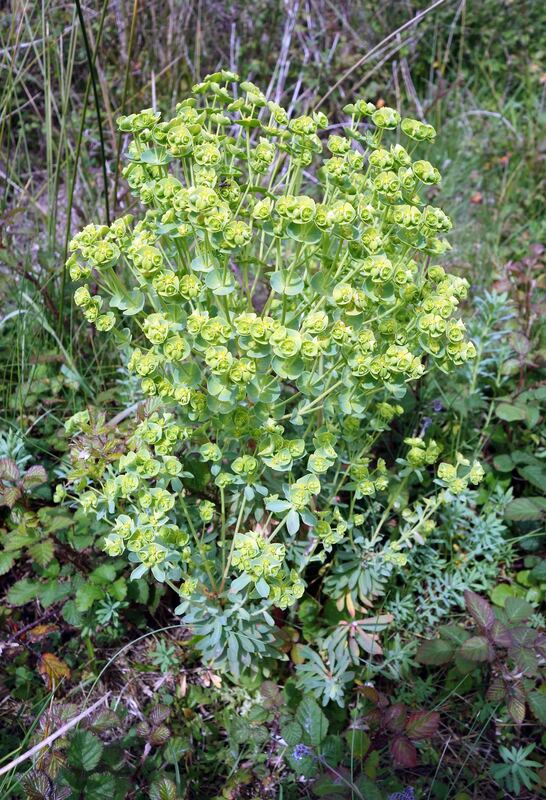 Sea spurge has become an invasive weed in Australia, crowding out native Aussie flora apparently (2). A lot more could be written about this plant, particularly concerning the constituents of its milky sap, or latex, which is toxic – the plant’s way of defending itself – but contains an array of chemicals (diterpenes) with interesting properties. All of these photographs were taken in Galicia, Spain.